Players and officials of Spanish football club FC Barcelona played their last respects to former coach Tito Vilanova during a memorial service at Barcelona Cathedral on Monday. 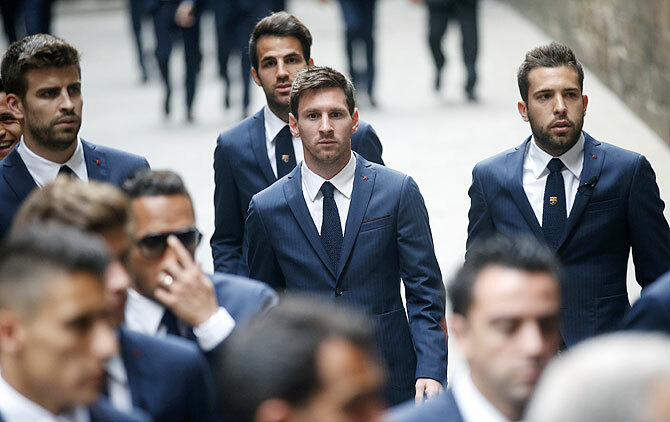 FC Barcelona's players (top left to right) Gerard Pique, Cesc Fabregas, Lionel Messi and Jordi Alba, arrive to attend former coach Tito Vilanova's memorial service at Barcelona Cathedral on Monday. 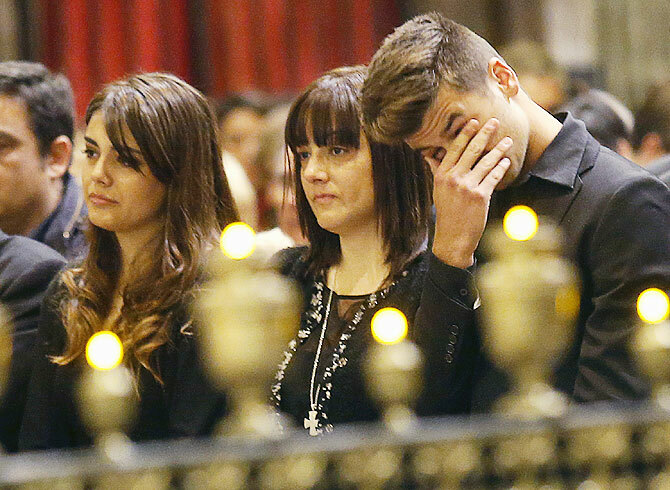 Tito Vilanova's Daughter Carlota (left), wife Montse (centre) and son Adria (right) attend his memorial service at Barcelona Cathedral on Monday. Barcelona's Neymar, Dani Alves, Pinto and Javier Mascherano arrive to attend former coach Tito Vilanova's memorial service at Barcelona Cathedral on Monday. 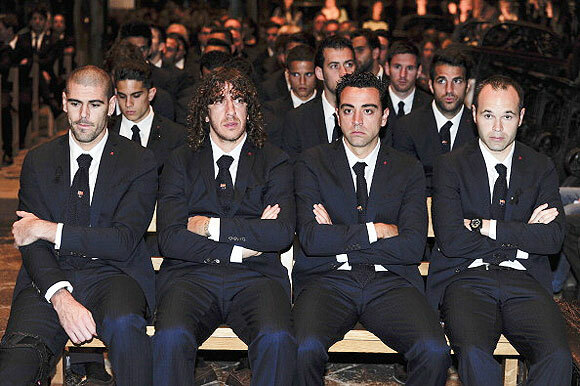 Barcelona's goalkeeper Victor Valdes, captain and defender Carles Puyol and midfielders Xavi Hernandez and Andres Iniesta sit at the Barcelona Cathedral during Tito Vilanova's memorial service on Monday. Three days after the death of Tito Vilanova, Éric Abidal, who worked with him at the Club between 2008 and 2013, joined his ex-teammates in training and speaking to Barça TV explained: “I had to be here, this is an important day. We loved him a lot, him and his family”. Asked to remember a special moment he’d shared with Tito, Abidal explained: “I remember that not long ago, he sent me a photo of when we had won a title and the two of us posed holding up the cup. Both of us had to face a tough fight and we shared many things. We spoke a lot. For me it was more important than ever to be her close to his family and the Barça family as a whole”. Abidal, himself a cancer survivor, went on to say that 'God helped me fight cancer'. IPL PHOTOS: Virat goes viral in the UAE! IPL-7: 5 Indian bowlers who came away with maidens in the UAE! PHOTOS: When Masaba and Sakshi added spice to Chennai's win!